Vern Dander, a former Hughes test pilot from Colorado, has very kindly sent me some papers and photos from the personal archive of a former neighbour of his - Horst Dieter Lux. Horst Dieter Lux is a name that might be familiar to readers of Robert Forsyth’s impressive study of Luftwaffe ‘Mistel’ or composite aircraft development (Classic Chevron, 2001). 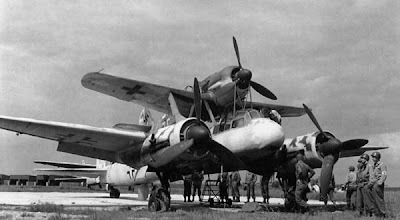 According to his own account Lux played a key role in the development of German ‘piggy-back’ aircraft, although how ‘key’ is not clear in the literature. 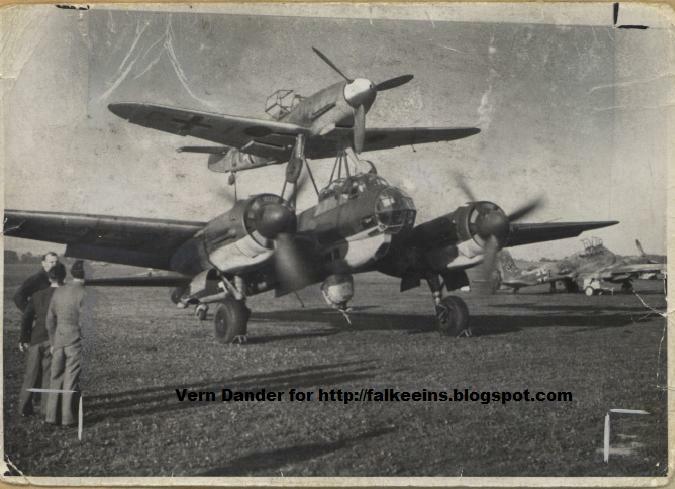 Secondary sources in particular ‘Die Geschichte der Huckepack Flugzeuge’ by Arno Rose ( Motorbuch 1981) quote Lux as being assigned to KG 200 on Werner Baumbach’s personal staff to oversee and coordinate Luftwaffe requirements and to develop a pilot training programme. This followed a period as TO with KG 30 and a close association with Dietrich Peltz. -the first use of the ‘fly-by-wire’ concept, the pilot in the upper aircraft operating the controls of the ‘carrier’ aircraft electrically.. The idea was that the lower craft in the composite arrangement carried a 3-ton charge and was flown to within five miles of the target by the fighter mounted above it on pylons. Once within close range, explosive bolts enabled the fighter to separate and return home while the lower component packed with explosives continued to the target at a selected glide angle – a huge unmanned flying bomb. After Foggia Peltz was tasked with developing the use of pioneering types of guided missiles then under development in Germany, such as the Fritz X and Henschel Hs 293, also designed to be deployed against Allied shipping. Peltz moved on quickly and aged 28 became the youngest General in the Luftwaffe when he took over the bomber arm (General der Kampfflieger). According to Lux 'the 'Piggyback' idea lived on and Peltz subsequently asked Lux to serve as his "advisor and evaluation pilot ". When funds finally became available Pelz asked Lux to head up the 'Piggyback' development programme.
" ..It was a challenging programme - two aircraft, a fighter and a bomber, had to be mounted together, a fly-by-wire system developed so that the combined aircraft could be flown from the fighter cockpit and a large warhead (3.5. to of TNT) had to be mated to the nose of the bomber, replacing the cockpit..I made the first flight about two months after the start of the programme. The development of the fly-by-wire system made up the bulk of the flight test programme followed by stability and control tests to establish safe separation over a wide speed range. The single-channel fly-by-wire system was a hazard in itself and we were lucky if there were no upsets - mostly there were, ranging from sudden hard-overs to instability to explosive bolts which failed to explode...eventually the bugs were worked out and on D-Day five of my aircraft were prepared for their first combat sorties....."